Just five weeks ago, the LSU baseball team returned from a lost weekend in Austin. The Tigers were swept in three games by Texas. The LSU pitching staff gave up at least seven runs in all three games. There was no doubt that head coach Paul Mainieri and pitching coach Alan Dunn had some work to do to get the Tigers to a championship-caliber level on the mound. 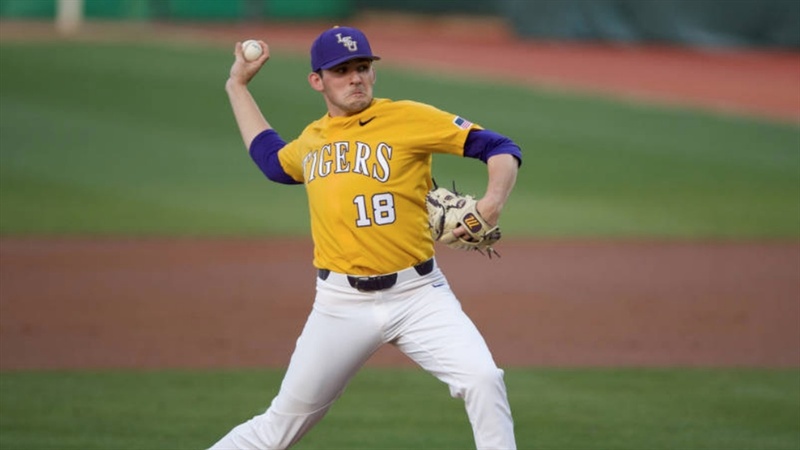 During the month of March, LSU pitchers – although missing a few injured ones – have made major improvement. Four weeks into the Southeastern Conference schedule, the Tigers have an 8-4 record – one game behind Georgia in the overall standings. LSU has put itself in this favorable position by winning series the past two weekends against Mississippi State and Texas A&M. In both series, the Tigers won the decisive third game due to outstanding starting pitching. Eric Walker threw seven shutout innings in LSU’s 11-2 victory in the series finale at Mississippi State. Then, on Saturday night, Cole Henry gave up two runs and six hits in eight innings as the Tigers beat the Aggies 9-3 in the rubber game of their series at The Box. LSU’s pitching was outstanding all weekend against Texas A&M. The Tigers needed a high level of performance since two Aggies starters were downright dominant. John Doxakis gave up one unearned run in 6.2 innings in a game the Tigers rallied for a 2-1 victory. Then, Asa Lacy allowed one hit and struck out 11 in six scoreless innings. LSU nearly came back from six runs down against the Texas A&M bullpen. But, the Aggies held on for a 6-4 victory. Poor defense enabled Texas A&M to tack on three needed insurance runs. The Tigers’ ERA in the three games against the Aggies was 2.33. Zack Hess matched Doxakis as he yielded one run and five hits in six innings. Three scoreless innings by relievers Trent Vietmeier and Devin Fontenot kept Texas A&M in check to set the stage for Josh Smith’s game-winning home run. Walker had one bad inning in the first game of Saturday’s doubleheader. The Aggies scored three runs after Walker issued a pair of walks. Relievers Matthew Beck and Todd Peterson threw five innings and gave up three unearned runs. Minus the errors, LSU would have come back for a victory. The star of the weekend was the freshman Henry. After giving up two first-inning runs, Henry was in complete control. He blanked Texas A&M on four hits over the next seven innings. Henry walked none and struck out nine. Henry has developed into a capable weekend starter. The Tigers’ pitching staff is taking shape. The three weekend starters are Hess, Henry and Walker. Hess and Henry can go deep into a game. Five effective innings represent a nice outing for Walker. Fontenot has taken over the closer’s role from Peterson. Fontenot is throwing in the mid-90s. Vietmeier, Beck and Peterson are the top three set-up men in the bullpen. Vietmeier, who has been the biggest surprise on the pitching staff, can be used as a long reliever. This group can get stronger when Ma’Khail Hilliard and Landon Marceaux return to health. Now, the Tigers won the series against the Aggies with just two hitters having big weekends – Smith and Zach Watson. Smith, who was 6-for-12, had the game-winning homer in the eighth inning Friday. Watson, who was 6-for-14, got four of those hits in the series finale Saturday night. LSU beat Texas A&M with Antoine Duplantis getting one hit and Daniel Cabrera not playing due to a thumb injury. But, a team does not need a lot of punch at the plate if the pitching is very good. The Tigers have now won six of their last seven games. In the six victories, LSU allowed a total of 11 runs. The Tigers play four times away from The Box this week – Tuesday at Southern and Friday through Sunday at Missouri. With six weeks remaining in the regular season, Georgia has established itself as the favorite to win the SEC title. LSU is one of a group of teams ready to challenge the Bulldogs. If the Tigers continue to receive quality pitching, they can end up being the No. 1 team in the SEC.